VRIENTS -Limburgensis Ducatus Tabula Nova. VRIENTS, J.B. - Limburgensis Ducatus Tabula Nova. Limburgensis Ducatus Tabula Nova. - VRIENTS, J.B. Title : Limburgensis Ducatus Tabula Nova..
Map maker : VRIENTS, J.B.. Size : 15.5 x 18.8 inches. / 39.3 x 47.8 cm. 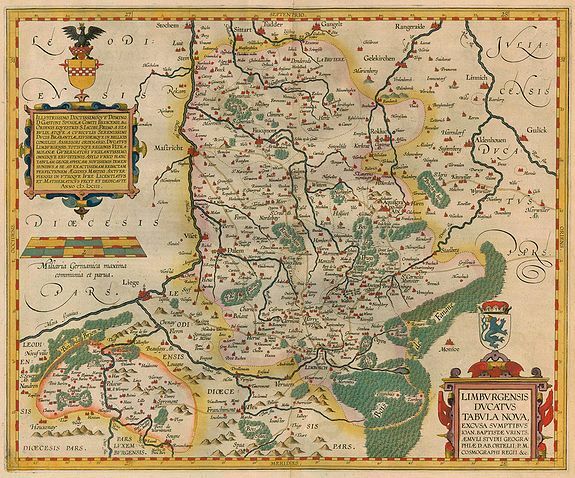 Description :Rare map of Limburg, only found in the later editions from Ortelius' Theatrum Orbis Terrarum, published by Vrients. Latin text on verso. Condition : Very good to mint condition.